Earlier this week I was pleased to speak at the monthly Geek Girls Toronto event. Hosted at the Mozilla offices, a sold-out audience showed yet again that there is enormous public interest and concern with recent privacy and surveillance developments. 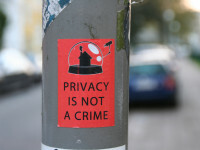 A video of the talk, which focused on the problems associated with lawful access, privacy reform, and surveillance, is posted below. 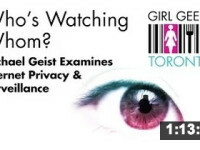 I participated in a talk at the Toronto Public Library titled Who Owns our Secrets. The discussion was moderated by Brent Bambury of CBC Radio and participants included former CSIS Assistant Director Ray Boisvert, world-renowned surveillance scholar David Lyon and BC Civil Liberties Association Policy Director Micheal Vonn. We discussed the balance between security and privacy. I participated in a panel titled The Internet, Free Trade, and Transparency: An International Perspective as part of Yale University’s Trade and Transparency in the Internet Age. The panel was moderated by Margot Kaminski and the other participants were Peter Yu, Ante Wessels. We discussed the impact of WikiLeaks leaking a draft of Anti-Counterfeiting Trade Agreement and parts of the Trans-Pacific Partnership Agreement , another free trade agreement. Both leaks led to considerable public debate over both the content of the agreement and the negotiating process. The leaks, and their policy effects suggest there is a need for discussion of trade and transparency in the Internet Age.